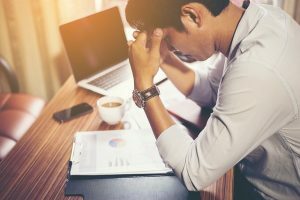 Managing Work Stress: Is Your Side Hustle Making it Worse? When you are building a business or a private practice it can be tempting to take on a little side hustle to help fill in the gaps and get the bills paid. It’s not a bad idea to diversify to some degree when you are in the phase of just starting out and growing your own private practice as a therapist or coach. But if you are not careful you can find yourself experiencing added stress that can actually set back all your plans and your efforts to get your dream practice up and off the ground. The process of managing work stress can feel daunting when you are going in too many directions. It’s important to consider if what you’re doing on the side is helping or hurting your process of building business. Managing work stress may involve reevaluating your side hustle. Recently I was talking with one of my career navigation coaching clients (permission gained to share his story!) recently whose experience last year inspired me to write this article. When Fred contacted me for professional coaching support, he was in a bit of a pickle. He had left his long time position with a community mental health agency to open his own private practice providing a specialized therapy service for couples and families. Getting his business off the ground had taken longer than he hoped and he began feeling nervous that he wouldn’t be able to pay his bills and meet the needs of his young family. Fred decided to do some side hustle to make money and began dabbling in day-trading. A buddy of his from college had turned him onto this way to make money on the side but little did he know the volatile nature of this kind of work. It ended up consuming his time, energy and attention taking away from his efforts to build his dream of having a private practice using the specialized skills he had trained in for couples and families. Fred’s stress level was through the roof and he felt his dream had derailed. Fred and I got right to it in our very first session because he needed immediate change of course. We decided together that it would be best for him to put the day trading aside for a bit. The nature of that particular side hustle was far too high stress and demanding of his constant vigilance. Managing work stress had become unmanageable. He had managed to set aside enough money from that gig he could afford to take time off and recalibrate. After getting his private practice building plan back up and running he determined any side hustle he chose to have would be something that was linked to his work as a mental health professional passionate about helping families. Overtime he managed to develop several streams of income including an online course, a training workshop for other therapists, an outreach program contracted for by his former agency and a small handbook he sold off of his website. There are ways to have a successful side hustle without all the stress. Side gigs can be a good thing. Diversifying your allocation of time and energy when you need to ensure income is flowing in can work beautifully IF your multiple streams of income are well-chosen and managed with care. Also, it’s essential that you have in place a PLAN for managing your stress at work and attending to your self care. It’s all about the process of balance. And the process of balance involves attending to practical means of good old time management, prioritization and mindfulness throughout your day. Don’t just do it for the money. Yes, you gotta eat. And yes sometimes practicality wins out necessarily over preferences. But if you’re going to do a side gig to pay the bills, look for something that is at least linked to the passion you have about the business you are trying to grow. Do it for the money AND let it be something you either enjoy OR something that will help contribute to the future of your business’ development. Allocate your time. What happened to Fred is he jumped into a side hustle without realizing how time-consuming it would be. Before you agree to sign on to a side gig be sure you understand very clearly what it will require of your time and be clear about how much time you have to spend on it. Dig into your primary work daily. If you are working to build a private practice you must put in the time every day to make authentic new connections, nurture existing relationships with others in the community and attend to the back-end tasks of creating and implementing systems. Block off time each day to focus solely on your primary work before engaging in your side hustle work. Remember the side hustle is to supplement as you build your business. Take breaks. It can be all too easy to have your entire day and night gobbled up if you’re working on building your practice and then heading off to your side gig. Be sure to build in breaks. The mental benefits of taking breaks during the day will help tremendously in managing your work stress. Honor your dream. It can be all too easy for a side gig to pull you away from the dream that drove you to develop your own private practice. Remember WHY you chose to begin building your own business. Never forget your WHY. Revisit it frequently. The seduction of making money fast in a side hustle can derail your dream; but, if you are able to consciously remember the root of what motivated you to start your own business, the passion that prodded you to take that leap you will stay on track. If you feel you may benefit from private career coaching contact me so we can schedule a brief complimentary phone consultation to see how else I may can help you.